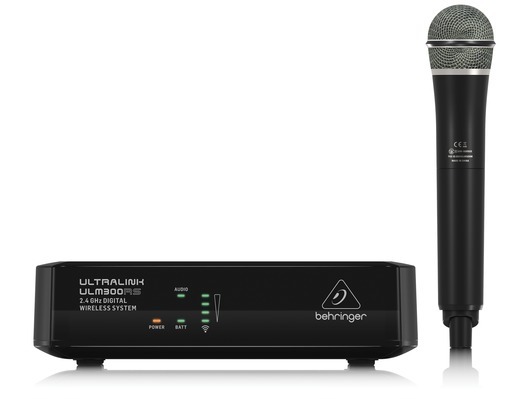 The Behringer Ultralink ULM300MIC is an affordable yet high-quality digital wireless system featuring 1x ULM300M handheld wireless microphone and 1x ULM300RS single-channel receiver. Incredibly straightforward to use, the microphone instantly pairs with the receiver, while the LEDS on the front panel indicate the presence and strength of the signal. This means that you can set up in no time, without having to deal with cables. For clean, high-definition sound, the ULM300MIC features digital 2.4 GHz wireless connectivity - this frequency band is digitally encrypted and nowhere near tv stations or mobile phone towers, so there will be no interference. With 24 hours of performance time per pair of AA alkaline batteries and an impressive 200ft/6m range, the ULM300MIC is a brilliant system for those who require more freedom of movement in their performance. 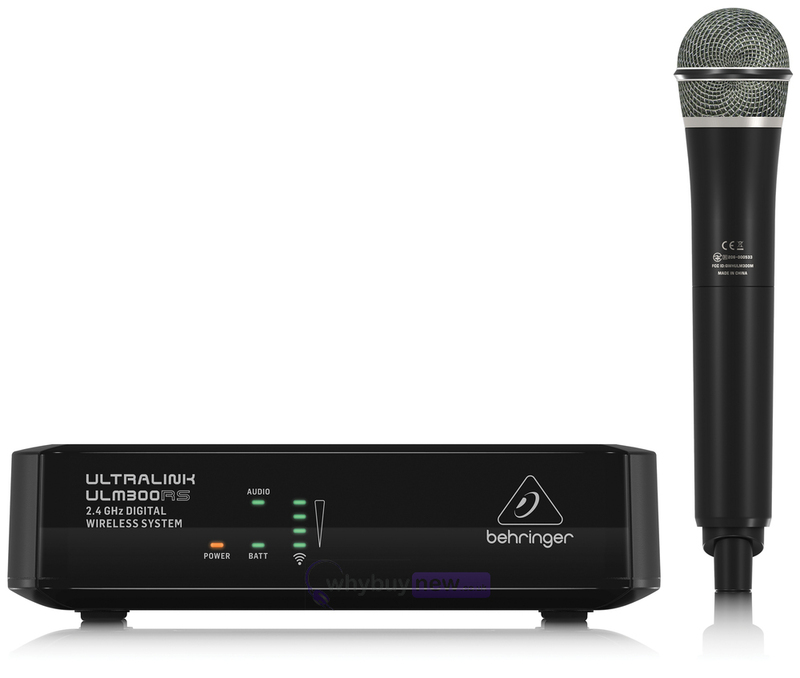 Once again we broke the affordability barrier with our new Ultralink ULM300MIC Wireless Microphone System, which includes 1 of our highquality ULM300M handheld mics and the equally-impressive ULM300RS single-channel receiver. Now you are free to work the room to your heart's content, without the hassle and restriction of cables underfoot. Highest-quality sound is provided by the custom-designed microphone capsule that is optimized for vocal performance, and the built-in transmitter that operates in the license-free 2.4 GHz range. Our state-of-the-art transmitter operates in the 2.4 GHz frequency band, which is well out of the way of TV stations and cell phone towers. And since it is digitally encrypted, your signal gets through in all its pristine, high-definition quality, without the random artifacts that often plague other wireless systems. The ULM300RS single-channel receiver tracks your every move, with a range of up to 200 feet (60 m). Replacing batteries in wireless mics can get expensive really fast and having them die in the middle of your set can be a real showstopper! That's why we devoted extra time in developing the ULM300MIC to ensure that battery life was extended as much as possible. You get an honest 24 hours of performance time from a pair of AA alkaline batteries, which are available virtually anywhere on the planet. Setup couldnt be easier, because the ULM300M mic automatically pairs with the ULM300RS single channel receiver without you having to lift a finger. Convenient front-panel LEDs on the receiver show your signal presence and strength, while indicators on the transmitter let you know at a glance when it's time to change batteries. Audio outputs are balanced XLR and unbalanced 1/4" TS, allowing you to connect to PA and conference room systems or high-quality instrument amplifiers. We wanted the ULM300MIC to be ultra-easy to operate, so we gave each mic easy-to-understand and operate Volume buttons right on the microphone body. And should you accidentally wander into the Feedback Zone, we included a handy Panic Mute function that engages when you press and hold the Volume Down button. happy with product as produced good vocal speech sound without any interfernce. would recommend to all who are involved in functions and parties. the battery life is beyond belief to last 24hrs. downside- not attractive and a bit bulky looking.